Following it's launch last month Disco Bloodbath recording released Gone Ghost, its sophomore single, last week on vinyl (the digital release drops on 21 August). 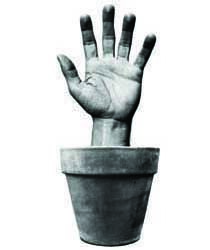 A hand plant. In a pot. Of course. And to be honest this release pretty much nails it. It's a frigging wonderful rapture of electronic soul and technology - Pistor and Watts are dragging us on a dawn chase and it's an otherworldly experience. Spectral melodies and large synth work sews an analogue rush of endorphins and a injection of squelching acid on the title track. Shorter but way more vicious, 'Arpy' has a utterly unforgiving rapid fire bass line that initially reminds me (yet again) of Adonis' 'No Way Back' but cosmic synthesisers end up carving the record in two. The subsequent crescendo of layered staccato keys and ping-pong (or should that be wiff waif?) rhythms are sure to leave you breathless. Also featured is a storming acid remix of 'Gone Ghost' by Jamie Blanco - think early acid house complete with eighties synth-pop drums and a fair amount of echo. It calls to mind the classic 'Happy House' mix of Frankie Goes To Hollywood's Paul Rutherford's 'Get Real' but here the drums feel tougher and here Blanco has combined it with the strongest melodic elements of the original to make something genuinely beautiful that transcends genre. Check out the full version of 'Gone Ghost' in the YouTube player above but also listen to the all too short preview of Jamie Blanco's mix in the player below. It's way too good to pass up. Consider this one of my favourite things so far this year. Gone Ghost is released through Disco Bloodbath Recordings - the vinyl release is out now and the digital release is due on 21 August.